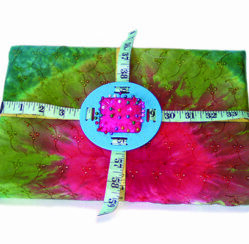 Fobbie ~ Creative Gift Wrapping in a Cinch ~ Sew It's Your Birthday! Home » Feminine Themed Wrapping » Sew It’s Your Birthday! Do you have a seamstress in your life? I enjoy wrapping with fabric. It looks lovely and it’s reusable. More and more I am on the hunt at estate sales, or the bargin bin at the local fabric store. I stock up and then have it available for a quick gift wrap. I fell in love with this tie-dyed fabric. I took a picture frame Fobbie® and a piece of felt and some batting and created a little pin cushion. I then added the colorful pins. A soft tape measure worked perfectly instead of ribbon. Tailoring this gift—so to speak—became a gift within a gift and gave the package a real wow factor.